SAN ANTONIO, TX -- Unique. That's The Quarry Golf Club. 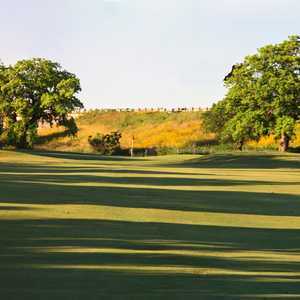 "Golfers come off the back nine and tell me they have never seen anything like it," said Todd McCabe, Director of Golf. "And people who have never played golf come to see the view from the clubhouse and take photos." Once upon a time The Quarry was way out in the country from old San Antonio, but now it's just inside Loop 410 and a short two minutes from the airport. "The limestone rock quarry digging started in the early 1900s," McCabe said, "and it was part of the Alamo Portland Cement Company. On top where you now see the new apartment complex was the old company town. It was a city in itself." The company town was named Anthony and was located on the Missouri, Kansas and Texas Railroad. St. Anthony's Shrine was erected there by Peter M. Baque in 1931. The church for the settlement was called St. Peter, Prince of Apostles, and had a parish school. When the cement company closed down in 1983, the site was abandoned, but Alamo thought something special should be done with the property," McCabe continued. "Of course there were some people who said there was no way you could build a golf course when Jack Parker put the idea in motion. Construction began in 1992 and the course opened in November 1993." Keith Foster was hired to design the course that includes a links-style front nine that plays through native rolling grasslands. There are no trees, but lots of water and bunkers to contend with. The back nine is entirely down in the 100-year-old quarry pit. "The Quarry was a very fortunate break for me," said Foster. "The job came along just after I broke away from Arthur Hills' design group and it was my first real benchmark course. It enabled me to escape and do something different. 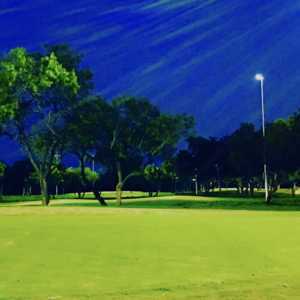 It is an emotional and exciting golf course and like the origins of the game. It was a very compelling job for me." "We had a tournament before we opened and I'll never forget PGA Tour pro Bill Rogers coming to me after his round and commenting on how almost every golf course you find a hole built to get from this point to another point," McCabe said. "But he said he didn't feel that way about The Quarry -- that it all just fit together." Rogers is Director of Golf at San Antonio Country Club. The course record 64 is held by PGA Tour pro J.L. Lewis. The Quarry plays 6,740 from the tips at par 71, but from the other three tee selections this is a very playable course. Even 80s and 90s shooters can feel good and score better than they normally do. "From the tees the landing areas might not look very generous," McCabe said. "but the fairways are plenty wide enough. Strong players can keep it in the 60s. Perhaps the trickiest effects are judging the wind down in the quarry. It can swirl. You might be up against one of the walls and not feel the wind, but it can be a factor." Six of the first nine holes have water hazards. Holes 3 and 4 require tee shots over the wet stuff, but it is very manageable. "Watery Grave", the par-5, 5th, 544 yards from the back, requires a target tee shot and second shot over a slim sliver of water. The Quarry nine's No. 13 is a visually intimidating dogleg left. This par-4, 362-yard challenge has a water drop off to the left and if you miss that hazard you could land in a long bunker guarding the left. Most will over-compensate and hit it too far right leaving a long second shot to a heavily-guarded bunkered green -- the smallest one on the course. However, if you can hit a true draw you will be in great shape for birdie. The par-3, 242-yard No. 16, requires a solid shot and is named "Gibraltar" because it is framed by a rock cliff. When you reach the 17th green be sure and take in the view -- you can look back down on the 16th green. And speaking of the 17th -- it's a par-4, 386-yarder named "Reload". Many average golfers will have to reload on this hole because the tee shot is a target drive. Too far left and you are down way below the elevated fairway. Actually the landing area is generous so just make sure you hit it far enough right, but not too far right or you will be in the rocks of the Quarry's eastern wall. The 18th, named "High Road Home", is a par-5, 565-yarder that has a narrow fairway and the Quarry wall on the right. Slices into the wall, covered with native plants and prickly-pear cactus, could get a lucky bounce back to the fairway, but don't count on it. Hit a long iron to the skinny landing area, then on the second shot you can hit 3-wood because the fairway widens nearer to the green. After the round enjoy the view from the Clubhouse which has a restaurant and bar where you can look down on the Quarry side and see every hole. "The Quarry is one of the most beautiful courses I have played so be sure and bring your camera. It was in great shape and the layout offers a variety of risk and reward options. A definite play if you visit San Antonio," said Paul Cameron. The Quarry hosts 48,000 rounds a year so be sure and make a tee time. It features Tif Dwarf Bermuda greens and 419 Bermuda fairways. "Ranked Top 10 of America's Greatest Courses in Texas" - '98 & '99 and Best in San Antonio by Golf Digest.. "Top 100 Women Friendly Courses in the United States" - '98 & '99 by Golf for Women Magazine. One of America's Best Golf Courses, 1995, by Golf Week. Monday through Thursday $75, Friday through Sunday $85. Cart and range fees are included. Located just two minutes away from the Airport and six minutes from downtown San Antonio. From downtown take 281 north. Exit Basse Road and turn right. The Quarry Golf Club will be on the right hand side of the road, approximately 1/2 mile. From the Airport take 281 south toward downtown. Exit Jones Maltsberger Road. Turn left on Jones Maltsberger to Basse Road and turn left. The Quarry Golf Club will be immediately on the right.